I have a thing for old books. Vintage dictionaries, out of print novels, nonfiction nature themes, outdated children's activity books- I have quite a delightful collection. I love the yellowed pages, fabric covers, gold leafing, vintage photographs and illustrations. My favorite, by far, is the flow of language and eloquent wording. They just don't write 'em that way anymore. These books, or bits and pieces of them, are finding their way into my art. Altering books is an old art form, but rather new to me. We were always told as kids not to write in our books, but I like to think I'm breathing new life into them. And they are providing me with a unique new canvas, just in time to tell my story through art. It's a great excuse to use up all those odd bits of paper left over from collage and scrapbooking. It's also a perfect little album for snapshots that may work their way into other pieces of art eventually. In this book I can play and practice composition and color theory, both areas I need to work on. The small size of the pages (about 5x7) makes it less intimidating to fill than a larger art journal. And once I get into the inside pages, there will be endless inspiration from the old text- poems waiting to be found! Today I just designed one of the end pages, but I have plans for this little book. Each page can tell it's own story- or not. 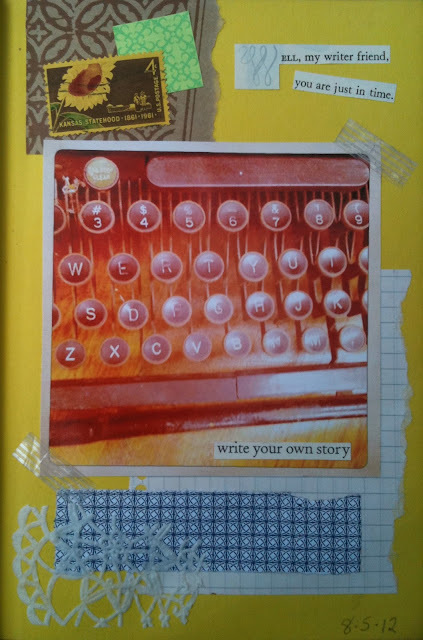 There can be a theme to the photos, words and collage bits, or it can just be a mini art journal. This particular book, published in 1966, is called Stalking the Good Life. I think it will lend itself beautifully to telling the story of our life here by the sea. One of the greatest things is that once I had collected the elements (which didn't take much thought) it only took me about 10 minutes to put the page together. I've been looking for a quick creative activity that I can do on those days when there's not much time, and these playful altered book pages might be just the thing I need to get out of my own head, make art fast and not stress so much about the end result. It's less pressure, somehow, than working on a canvas and the possibilities are endless.